Nefarious has an awesome birthday. His first birthday was on Free Comic Book Day. Coolest morning ever. We went over to the local comic book store and introduced him to Daleks, Imperial troops, and The Batman. 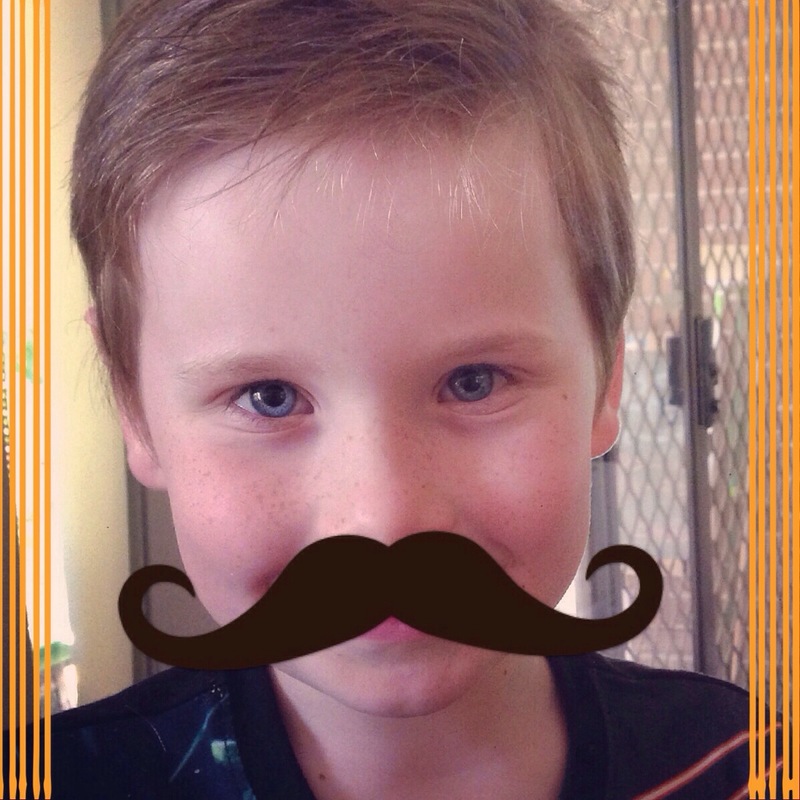 It has since become a bit of a tradition for young Nefarious to celebrate his birthday with some sort of comic book festivity. No complaints from the rest of the family, of course. 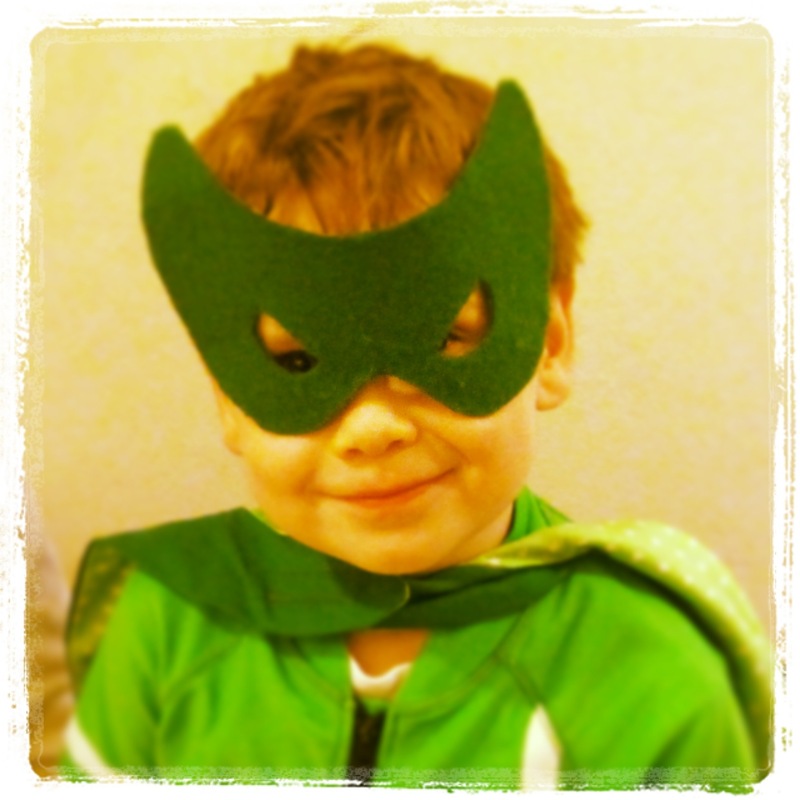 This year was Nefarious’ first birthday party – and he wanted a super-hero/villain theme. With a trip to the comic book store. 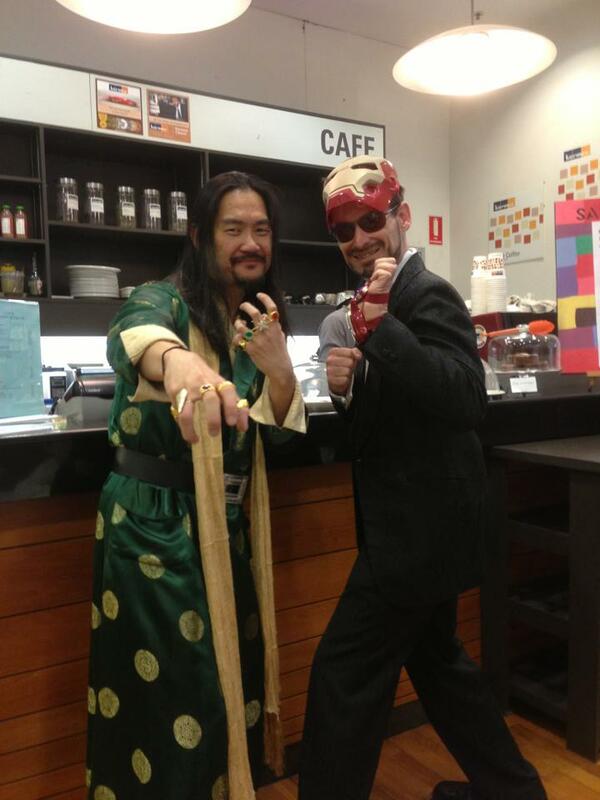 In costume. And it was brilliant. 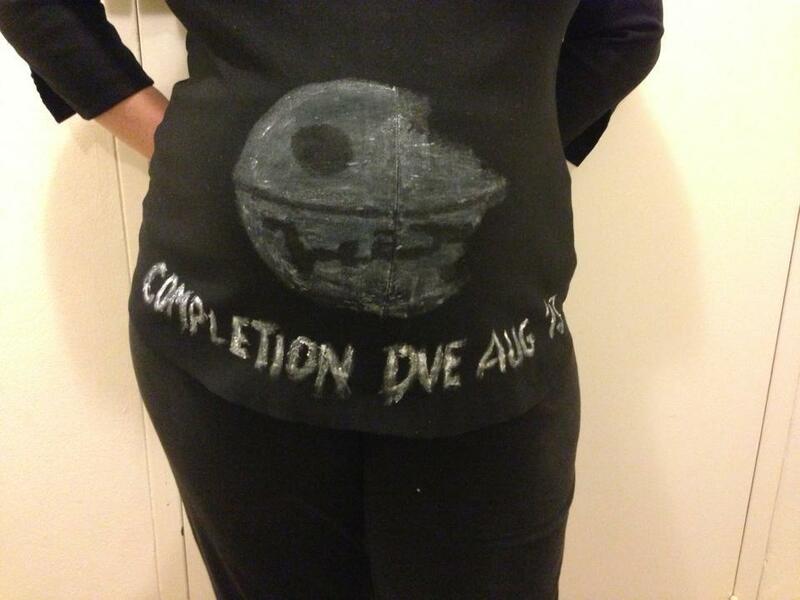 Thanks to the many minions on Facebook and Twitter who provided suggestions for my pregnant bump to still be in cosplay. Stand by your theme: Super-hero/villain. Spawnlings love it, but they love it even more if the parents are in theme too! Carry the theme through everything: There are some really easy ways to carry a theme through food and decorations. 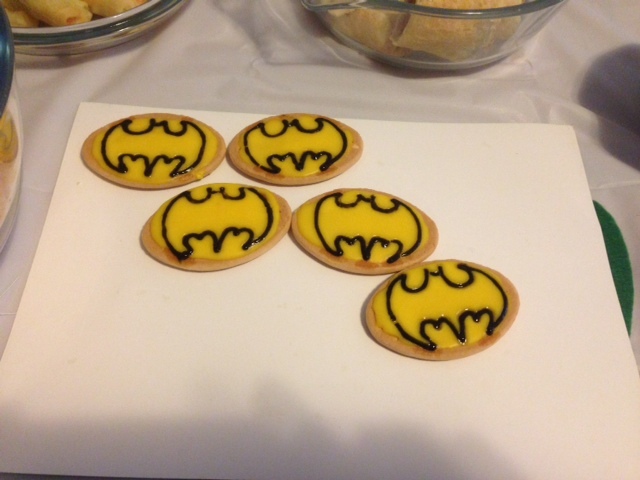 For example, EG Dad was responsible for the Batman Biscuits (below). They are simply Arnott’s Arrowroot biscuits with a slather of yellow icing and black writing-icing to draw the Bat Signal. So easy! Keep it simple but strong: You don’t need to go over the top with the games and decorations. Just change the name for the kids. 4yo spawnlings loved “Pass the Kryptonite” as the pass-the-parcel game, with each layer wrapped in green paper. And since Nefarious is a Ben 10 fan, we included “Pin the Omnitrix on Ben”. Music makes it: Music can be a tricky one, but a little thought goes a long way. We happen to have a Star Wars Episode II CD (only good thing from that disaster of a movie…) and it was an absolute hit for the spawnlings! So easy to recognise the theme! A bit of Buble singing Spider-Man seemed to appease the parents who stayed too. Save a bit of creativity for the Party Bags: We had a few older siblings tag along – so we kept a couple of Free Comic Book Day comics for them. Personally, I prefer to do something different with birthday bags. So this time I made capes – I think there was a bit of Esme-defiance kicking in here. Nevertheless, the capes definitely The Thing. Still played with around our Lair and other houses in the neighbourhood. Birthday Cakes are ESSENTIAL: I don’t care whether you make it or not. The kids don’t care whether you make it or not. But it has to carry the THEME!! 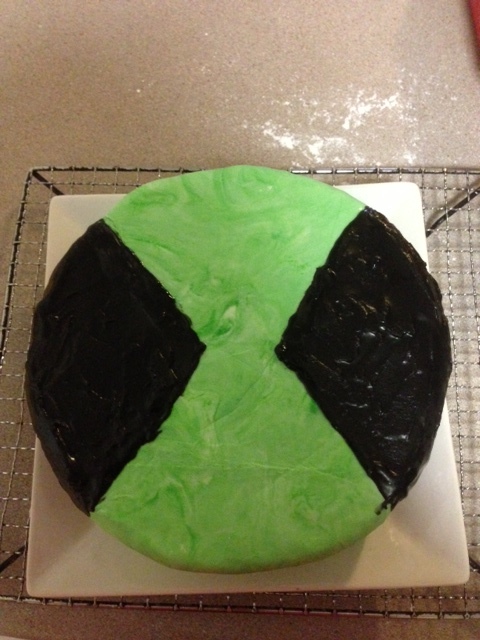 Fortunately Nefarious was ecstatic with an Omnitrix cake. Seriously – how easy was that! So there you go. Don’t over-do it. Kids like it simple. Nefarious absolutely loved his birthday party, and was still talking about it later. It was easy-going and popular with the other spawnlings. Talk about simple mind-manipulation. I think I have a team of potential minions for my spawnlings, all set and ready to go. That, to me, is the greatest sign of success.